The 2004/05 production of Swaziland’s staple food crop, maize, is estimated at 82 240 tonnes, about 10 percent higher than last year’s official post-harvest estimate but 6 percent below the average of the previous five years. The improved performance was due to favourable rainfall and increased use of chemical fertilizers combined with farmyard manure in the Highveld and Middleveld. The Lowveld and parts of Lubombo suffered serious crop failure due to poor rainfall. From a longer-term perspective, maize production in Swaziland appears to be on the decline. Factors causing this decline need to be investigated; most likely they include recurrent droughts and the impact of HIV/AIDS. Cereal import requirements for 2005/06 marketing year (April/March) are estimated at 110 600 tonnes, of which 69 700 tonnes are expected to be imported commercially. With about 6 200 tonnes of food aid in stock and pipeline at the beginning of the marketing year, there remains an uncovered deficit of 34 700 tonnes which needs to be met by additional international assistance. Access to food for poor households remains a serious issue. Available data indicate that per capita consumption of maize has been declining over time without significant cross-substitution with other foods. There is an urgent need to reform the country’s existing pricing and marketing policies for maize. It is estimated that 226 640 people will face severe food shortages for 4-7 months during the 2005/06 marketing year, with another large segment of the population suffering from shortages of shorter duration. The Swazi VAC estimates that approximately 27 020 tonnes of cereals (or income equivalent) will be needed to meet the deficit of the affected households. Over the past decade, Swaziland has repeatedly experienced droughts or inadequate rainfall and resultant poor harvests. The rainfall this ending season, though more favourable overall, was characterized by a late start in October and deficits in December at crop establishment stage and in February at tusselling stage. Concerned about the potential impact of these breaks on the nation’s food production, the Government of Swaziland requested FAO and WFP for assistance in assessing crop performance and overall food supply situation for the 2005/06 marketing year (April/March). Accordingly, an FAO/WFP Crop and Food Supply Assessment Mission (CFSAM) visited the country from 30 April to 12 May and carried out the requested task. The Mission’s findings in this report are based on intensive discussions with various departments of the Ministry of Agriculture and Cooperatives (MoAC), Central Statistical Office (CSO), National Disaster Task Force (NDTF), various NGOs, parastatals such as National Maize Corporation (NMC) and National Agricultural Marketing Board (NAMBOARD), major milling companies including Ngwane Mills and Universal Milling, and input suppliers such as Swaziland Farm Chemicals. These discussions were supplemented by extensive field visits which covered all communities in the country. The Mission was accompanied in the field by government officials from relevant ministries, NGO representatives and two observers from the US Embassy. A total of 144 farmers and several field extension officers were interviewed, and standing and stored maize crops were inspected. The Mission found that the 2004/05 agricultural season was better than last year in the Highveld and Middleveld, both zones having achieved above average production. By contrast, the Lowveld and Lubombo performed poorly due to below average rainfall and late planting. Crops failed in large tracts of both zones. Overall, maize production in 2004/05 is estimated at 82 240 tonnes, which is about 10 percent higher than last year. 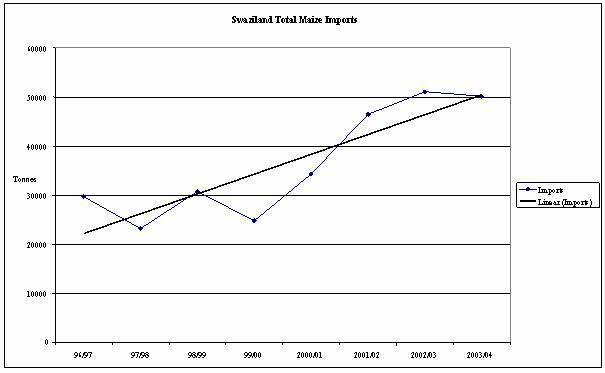 Time series data indicate that maize production in Swaziland is on a downward trend. The causes need to be investigated, but it seems likely that the impact of HIV/AIDS on agricultural production is beginning to show. The cereal import requirement for 2005/06 marketing year (April/March) is estimated at 110 600 tonnes, of which 69 700 tonnes are expected to be commercially imported. With 6 200 tonnes of food aid on hand and in the pipeline at the beginning of the marketing year, there remains an uncovered maize deficit of 34 700 tonnes which will need to be covered by additional international donor assistance. Access to adequate food supplies remains a serious issue for poor households, in view of falling household incomes, high unemployment, and the impact of HIV/AIDS. 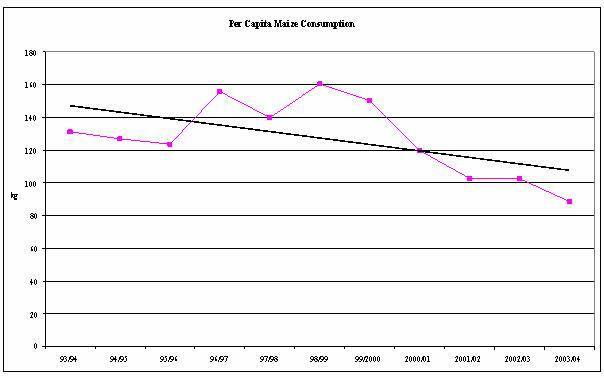 Available data show that per capita maize consumption is falling without being substituted with other foods. This is compounded by existing inefficient marketing and pricing policies which work against poor consumers. These policies need to be reviewed and reformed. Despite increased crop production at national level this year, food access for many households remains precarious especially in the Lowveld, Middleveld and Peri Urban regions. The contributing factors include the impact of HIV/AIDS, increasing unemployment due to recent closure of textile factories and rising poverty which have resulted in low purchasing power and diminished livelihoods. Although maize prices have dropped over the season by 10percent compared to last, the overall 45 percent price increase since 2002 continues to put a significant strain on households’ budgets, making it increasingly difficult for the poor to purchase enough food. It is estimated that 226 640 people will face severe food shortages of 4-6 months during the 2005/6 marketing year, with another 260 000 suffering from food shortages of shorter duration. The Swazi VAC estimates that approximately 27 020 tonnes of cereals (or cash equivalent) will be needed to meet the deficit of the affected households. Although Swaziland is classified as a Middle Income country with a per capita annual income of US$1 245 (2002), the poorest 40 percent of the population average only US$230 and 66 percent live on less than US$1 a day. Income distribution is very skewed, with 10 percent of the population receiving about 43 percent of national income. The contribution of agriculture to GDP is estimated at about 16 percent, compared to 50 percent from industry and 34 percent from the service sector. Maize is virtually the sole staple for the majority of the population, while major export income earners, according to 2003 estimates, include soft drink concentrates (49 percent), textiles (29 percent), wood pulp (11 percent) and sugar (7 percent). South Africa is the main trading partner, accounting for about 60 percent of total exports (the rest going to USA: 9 percent; EU: 8 percent; Mozambique: 6 percent) and 96 percent of its imports. Some indicators of Swaziland’s economic performance in recent years are summarized in Table 1 below. The relatively low GDP growth rate is largely the result of recurrent drought over the past several years which adversely affected agricultural production. 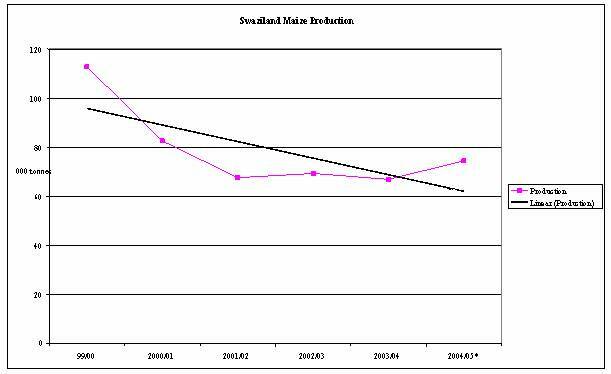 The apparent upturn in 2002 has been reversed and current forecasts indicate a rate of about 1.75 percent for 2005/06. Additional negative factors at play include declining direct foreign investment, the slowdown in the manufacturing sector spurred by closures of companies such as textile mills, and weak demand for the country’s exports, particularly in South Africa, her main trading partner. Average annual consumer price inflation fell from a high of 12 percent in 2002 through 7.3 percent in 2003 to 3.4 percent in 2004. It is expected to remain at around this level in 2005/06 largely due to a favourable agricultural outturn this season. However, this will be subject to economic performance in South Africa, which has a major influence on economic trends in Swaziland. The country’s currency, the lilangeni, which is pegged at par with the South African Rand, has appreciated against major currencies over the recent years, resulting in an unfavourable exchange rate for the country. This has hurt exports and contributed to the slow growth of GDP. The Lilangeni to US dollar exchange rate at the time of the Mission in May 2005 was around US$1=E6.40. The country’s net foreign exchange reserves were fairly stable between 2001 and 2003, averaging US$275 million, and improved by some 16 percent to US$323.6 in 2004. This improvement has been largely attributed to an increase in customs revenue from the South African Customs Union (SACU), the Government’s strategy to finance part of its budget through domestic borrowing instead of running down the reserves and the Central Bank’s decision to hedge the reserves against revaluation losses by shifting a sizeable portion from hard currencies to the Rand. In terms of imports, the available reserves are enough to cover an estimated 2.3 months compared to only 2 months reflected the previous year. Officially, the nation’s population is currently estimated at slightly over 1.1 million, which takes into account the impact of HIV/AIDS. Based on currently available information on the disease in the country, up to 40 percent of the population aged 15-49 years are infected, and life expectancy for the general population has plummeted from 65 years in 1991 to 37.5 years presently. The Government plans to undertake a demographic survey this year, which will generate improved data on fertility, morbidity and mortality rates, as well as an accurate picture of the country’s HIV prevalence rate and the effectiveness of past and ongoing anti-HIV/AIDS campaigns. Unemployment in Swaziland is currently estimated at around 30 percent of the economically active population, but if the definition included discouraged job seekers, the rate would be over 40 percent. The situation is likely to get worse with company closures, and it is projected that private sector employment will decline at -0.2 percent per annum over the foreseeable future. Trends in maize production over the past six years are shown in the graphs below, based on data from the Government’s Central Statistical Office (CSO) and, for 2004/05, Mission estimates. It is quite evident that maize production in Swaziland is on long-term decline as indicated by the trend line fitted to the data. Fluctuations around the trend reflect poor or relatively good years but the overall trend is downward. The Lowveld shows a particularly steep secular decline and this raises the question as to whether maize should be grown there at all. This is the driest part of Swaziland which is prone to recurrent drought. But even in the Highveld, the agroecological zone with the highest agricultural potential, the trend is downward. The causes of this decline need to be investigated, but it is likely that the impact of HIV/AIDS is contributing a significant part. The smallholder agricultural sector in Swaziland is the largest contributor to the livelihoods of the majority of the population and is the main raw material provider for the agro-based industries. Maize is the dominant crop and remains the staple food grown by the majority of rural households in the communal Swazi Nation Land (SNL) which accounts for about 86 percent of the land area planted. The land area under active cultivation has declined from about 69 000 ha in 1999/00 to 54 000 ha in 2003/04. The outputs for the same period varied from about 113 000 tonnes to 67 000 tonnes depending on rainfall, access to tractor hire, timely planting, fertilizer use, type of seed used and related crop husbandry. The remaining SNL area is planted with relatively small amounts of cotton, groundnuts, pumpkins, various type of beans and sweet potatoes. Cassava cultivation has emerged in the Lubombo Plateau. Efforts to improve SNL farming were made through the Rural Development Area (RDA) programmes. The aim was to bring SNL farmers to commercial or semi-commercial level through the use of yield increasing inputs and extension advice. These, however, failed to increase production mainly due to the fact that the incentives were inadequate for the risk and labour involved. Technologies such as hybrid maize and fertilizer use were promoted and readily accepted by the majority of SNL farmers but the main objective of the SNL farmer was to produce household requirements with reduced inputs of labour. The promotion of open pollinated composite maize varieties which are drought tolerant and cheaper to produce was given little attention. Although it is estimated that 98 percent2 of the total maize seed sold in Swaziland to date is hybrid types, in practice most farmers mix their own selected and saved open pollinated varieties with the hybrids for planting. Much of Title Deed Land (TDL) is planted forests mainly for the commercial production of timber in the Highveld and is also used for grazing. A small proportion is used for the production of fruits, vegetables, maize and fodder. Commercial maize production in the TDL accounts for about 10 percent of the total maize production annually. Off-season maize cultivation through winter cropping is practiced in the Lowveld for green maize production. One of the main constraints to maize production is related to financing. Due to the low producer prices, farmers are reluctant to sell and are retaining their produce in their homesteads instead of sending it to market. This limits their income considerably and that is why they are using low levels of farm inputs especially fertilizer or simply depending on farm-yard manure only. 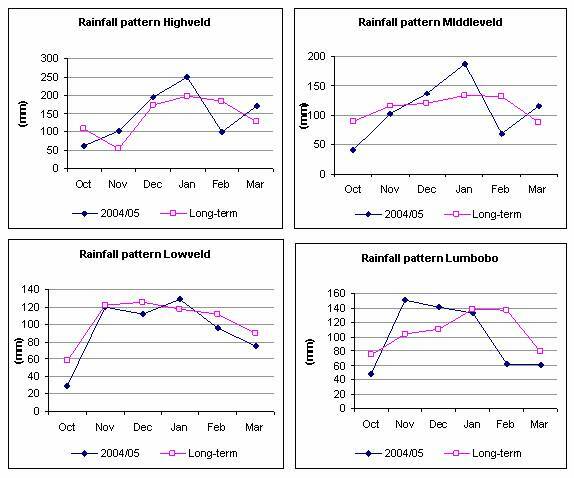 Although Swaziland has in general experienced a favourable agricultural season in 2004/05 in terms of rainfall, there is marked variation in the rainfall pattern by agro-ecological zone (see rainfall pattern charts in Figure 2). The Highveld recorded above average rainfall throughout the season and crop water availability was good except for the months of October and February. Poor rains in October prevented farmers from benefiting from an early maize crop as most sowing took place in November when the rains became more favourable for good crop establishment. Thereafter, heavy rains that fell in December and January took the crops through the critical vegetative and tasselling stages. The negative effect of the dry spell in February was offset by residual moisture from the heavy rain in December and January. Cumulative rainfall was higher than last year and rainfall distribution was better. In the Middleveld the rainfall was also above average except for the months of October and February although it was slightly below average in November. From November onwards conditions became normal and rainfall was well above average. The cumulative rainfall was higher than last year, is above average in the moist Middleveld and slightly below average in the dry Middleveld. The hail storm that came with the heavy rains in January damaged crops in areas around Central Ngwempisi Rural Development Area (RDA) in the Middleveld and another hailstorm on 10 March slightly damaged the maize crop during maturity in Mahlangasta RDA. In the Lubombo plateau, rainfall was above average for the months of November and December and slightly below average in January but well below average during the months of October, February and March. Cumulative rainfall was about the same as last year. In the Lowveld, rainfall was below average throughout the season except for January which recorded well above average rainfall. The rainfall pattern followed the long term trend and cumulative rainfall was slightly lower than last year. The poor and well below average rainfall has affected maize yields and in many areas crop failure was observed during the field visits. Pasture condition was affected by the poor rainfall in October but the situation improved in all the agro-ecological zones and the condition of livestock looked good during the missions’ field visits. Seed: Existing maize varieties used by SNL farmers are either hybrid varieties produced by private seed companies or local open pollinated varieties selected by farmers. It is estimated that 98 percent of the total maize seed sold in Swaziland is hybrid and about 1 200 – 1 300 tonnes of maize seed was sold during the past 2 seasons – down from 1 700 tonnes over the past 10 years. Seed multiplication is mainly carried out through contract out-growers mainly on commercial TDL. Farmers in the drier areas of the Lowveld and Lubombo districts have benefited from free distribution of seed from FAO’s emergency programme and NGOs that work with WFP. Fertilizers: Farmers use both organic (farm-yard or kraal manure - FYM) and modern chemical fertilizers on the maize crop. FYM is mostly either heaped out in the fields and broadcast just before ploughing, or placed in the fertilizer bins of the planter and mixed with chemical fertilizer. No information is available on the volume of FYM. According to the Ministry of Agriculture and Cooperatives over 60 percent of the SNL farmers use FYM and a small number purchase it. Farmers use different formulations of chemical fertilizers and the types available to growers are: 2:3:2 (22); 2:3:2 (38) and LAN 28 percent. The first two types are used as basal dressing and LAN is used as top dressing. A 50 kg bag of 2:3:2 (22) costs E 110 and similar bag of 2:3:3 (38) costs E 150. From the mission’s enquiries most farmers use the cheaper formulations unless fertilizer is supplied on credit against payment with maize. No data was available on the volumes of fertilizer sold during this season compared with the past years. Fertilizers are sold by traders and cooperatives through their RDA network. Data on areas planted are released by the Central Statistical Office (CSO). Estimated yields and production by district and agro-ecological zone are forecasted by the agro-metrological service on the basis of CSO data and Water Requirement Satisfaction Index (WRSI) for each dekad of every month throughout the growing season. The National Early Warning Unit (NEWU) of the Ministry of agriculture and Cooperatives publishes Food Security Updates on the basis of the agromet data. The authority to collate, publish and release the final figures on areas planted and production is vested with CSO and their final release is normally made in July/August annually after the CFSAM forecast is already published. For 2004/05 the CSO has officially released planted area figures but has yet to release production forecast figures. Poor rains in October forced farmers to plant maize under dry seedbed conditions in all the agro-ecological zones and replanting was done when the rainfall became more favourable in November. The general delay in planting was also due to lack of access to tractor hire service on time. Most farmers interviewed also felt that the quality of the seedbed prepared by the tractor hire service was poor and that most planting was done under shallow seedbed condition which affected the quality of crop establishment for both early and late planted maize. Early planting and better crop establishment was more evident in the Highveld and parts of the moist Middleveld. Most farmers in parts of the dry Middleveld, Lowveld and Lubombo Plateau planted late towards the end of November/early December and continued planting through December to early January to take advantage of the good rains. The Lowveld and the Lubombo Plateau are historically marginal maize growing areas due to low and unpredictable rainfall. Significant crop failure was noticed in many areas in these zones during the mission’s field visits. The land area planted to maize in each agro-ecological zone is given in Table 2. The total SNL national area planted with maize in 2004/05 is 56 425 ha, slightly above last year’s official CSO figure of 54 470 ha. The area planted to maize decreased in the Highveld by 23 percent compared to the five-year average probably due low returns to maize farming as perceived by the more market-oriented farmers The figures also show insignificant decreases in maize areas in the moist middlevled and the dry Middleveld as well as in the Lowveld compared to the five-year average. There is no change in the areas planted to maize in the Lubombo region. The yield forecasts for each agro-ecological zone are presented in Table 3. The yield estimates were derived from a sample of 144 households interviewed, consultation with extension workers and NGOs, visual observations on the condition of the maize crop and physical examination of maize stands in the field as well as the condition of the stooked crop in the fields after harvesting. The mission also used yield estimates of the Agro-meteorological Service which were based on the Water Requirement Satisfaction Index (WRSI), as well as published historic yield data. Source: Yields are mission estimates. In most areas of this zone the condition of the maize crop was observed to be good, except in pockets where late planting took place due to the delay in onset of rains in October and the late arrival of tractors for ploughing. Variations in yield were mainly due to the time of planting, the level of farm input use, and weeding due to shortage of labour at household level. Most farmers in this zone have applied lower amounts of both basal and top dressing fertilizer this season as compared to last year. The estimated maize yields in this zone range from about 0.5 – 4 t/ha. The dry spell in February did not affect the maize crop in this zone as the crop benefited from the residual moisture of the heavy rains in January. No abnormal pest damage was reported. Despite a significant decrease in the area planted of about 12 percent compared to last year, timely planting, favourable rains during most of the growing season and modest use of fertilizer resulted in a relatively high average yield of 2.25 t/ha. Production this year is estimated to be 5 percent higher than last year and 13 percent higher than the five-year average. In this zone, the maize crop performed better in the moist part as compared to the drier parts. In the moist Middleveld most farmers planted their crop in early November and used both basal and top dressing fertilizer but in lower quantities than usual. The estimated yields vary from 0.4 – 3.2 t/ha, taking into account the hail damage that occurred in January and caused damage to the maize crop in parts of Manzini region. Given that the area planted this year is about the same as last year and the 5-year average, with a yield average of about 1.8 t/ha, production is estimated to be higher than last year by about 46 percent and above the five-year average by about 25 percent. In the dry Middleveld, the land area planted this year is 10 percent lower than last year and the five-year average. In this zone, most planting took place late November and early December and farmers limited fertilizer use to sparse application of top dressing with LAN. The majority of the households interviewed did not apply basal dressing fertilizer. The high cost of farm inputs, planting under dry weather conditions and uncertainty about the returns to purchased fertilizer constrained fertilizer use. The estimated maize yields in this dry part vary from 0.35 – 2.1 t/ha. At an estimated average yield of about 1.2 t/ha, production is higher than last year by about 6 percent but lower than the five-year average by about 14 percent. Although there is an increase in the maize area planted this year compared to last year by about 42 percent, yields were extremely low this year and crop failure was observed in many areas of this zone. It is estimated that crops failed on about 50 percent of the land area planted in the Lowveld. This was mainly due dry spells in December, February and March which affected crop establishment, vegetative growth, tasselling and gain filling. Late planting and reliance on FYM as the sole source of fertilizer were contributing factors. An average yield of about 0.3 t/ha means that production this year is lower than that of last year by about 33 percent and about 69 percent lower than the five-year average. This zone has repeatedly suffered agricultural production disaster, as indicated by the large number of households which have been depending on food aid for several years. Maize yields were better on the plateau part of Lubombo than in lowlands which represent a larger proportion of the land areas planted in this region. Crop failure was also observed in some of the lowland areas of Lubombo. The land area planted to maize is about 33 percent higher than last year and is equal to the five-year average. With a yield average of about 0.5 t/ha, production is 64 percent higher than last year but about 43 percent lower than the five-year average. This zone has also experienced a major setback in agricultural production. Private commercial farms on Title Deed Land (TDL) are producing maize on an estimated land area of about 1 000 ha using high levels of inputs. Individual master farmers are also cultivating an estimated 100 ha under similar conditions. Yields vary from 5 – 8 t/ha depending on the performance of the season. Since most of the TDL land under maize and the master farmers are operating in moist Middleveld and were affected by the hail storm in January it is estimated that the average yield for this sector will be about 7 t/ha. This sector will contribute 7 700 tonnes of maize to 2004/05 national figure. Table 4 shows the total maize production in 2004/05 compared to the past 5 year average (1999/00 – 2003/04). The figures used for 2003/04 are the official CSO figures released last year for total SNL production after the CFSAM report was published. The estimated national maize production, including TDL and master farmers is 82 240 tonnes, which is about 10 percent higher than last year (SNL+TDL) but 6 percent below the five - year average. The Highveld and the moist Middleveld achieved above average production. 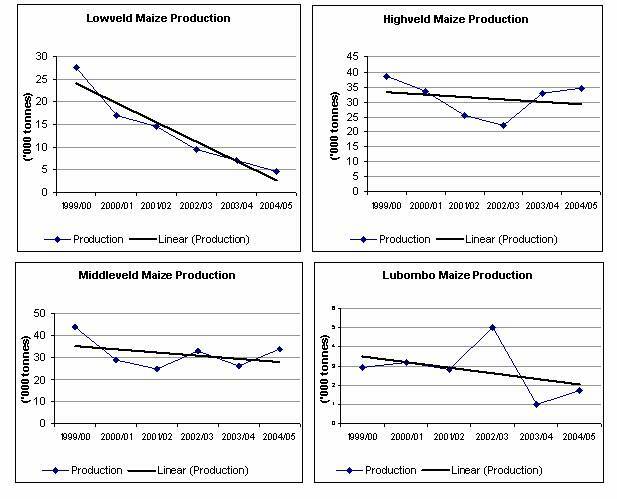 Production was below average in the dry Middleveld, Lowveld and Lubombo zones. Sugar cane is cultivated on about 50 000 ha. The land area under sugar cane is likely to increase once the irrigated downstream development of the Lower Usuthu River which includes resettlement commences this year and transforms smallholders to commercial sugar cane producers. The impact of all the new muti-donor funded initiative in increasing the land areas planted with sugar cane will depend on the price which has been on the decline recently. Cotton still plays a role in the food security of some households, particularly in the dry Middleveld and Lowveld, but production has declined. Some farmers interviewed in the Lowveld planted cotton this year but the yields expected will not pay for the cost of inputs. The decline in cotton production has also resulted in less disposable income being available for farmers. Various types of fruits and vegetables are grown for consumption and sale. Groundnuts, sweet potatoes, pumpkins, various types of beans, cowpeas and Jugo beans are also grown mainly for household consumption and some for sale. Cassava is gaining popularity in the Lubombo Plateau and its cultivation is likely to increase next year and may also expand to the Lowveld. Livestock play an important role in the production system and the livelihoods of smallholders in Swaziland. Cattle population is the largest but a large a large proportion of the households interviewed own goats and other back yard stock such as chicken and ducks. The cattle population has been on the decline mainly due the shrink in the country’s grazing land as a result of allocation of more land to resettle rural household. The condition of livestock and pasture looked normal this year except in the dry areas of the Lowveld and the Lubombo plateau. Swaziland is a net food importing country, even in normal rainfall years. However, maize imports have been rising rapidly mainly as a consequence of declining domestic production (see Fig.3). Source: NMC and NAMBOARD. (* white and yellow maize). The apparently elastic responsiveness of maize imports to domestic shortfalls is mainly explained by the direct convertibility of the Lilangeni into the South African Rand, meaning that availability of foreign exchange is not a constraint to commercial imports from South Africa. However, access to food for vulnerable groups remains a critical issue, in view of declining income-earning opportunities and remittances, high levels of unemployment, and the impact of HIV/AIDS on the livelihoods of households. Figure 4 below indicates that per capita consumption of maize from all sources (including food aid) has been declining over time, and it is not evident that it is being substituted by other foods, particularly in the rural areas. This situation is not helped by the current pricing policy for maize. The National Milling Corporation (NMC), a parastatal company, is the sole authorized importer of maize. It sells the imported maize to millers (two control over 90 percent of the domestic maize flour market) at a price it determines, while the millers in turn determine the prices to charge consumers for maize meal. Given the oligopolistic nature of the milling industry, maize meal prices tend to be too high for poor households which therefore have difficulties accessing adequate supplies. At the time of the Mission, the average price paid by consumers was four times the price charged to millers by NMC for grain. The whole marketing and pricing policy for maize in Swaziland needs to be thoroughly reviewed and rationalized to make it more efficient for the benefit of all, particularly for the poor. The forecast of Swaziland’s cereal supply/demand situation for 2005/06 marketing year (April/March) is shown in Table 5. It is based on the following assumptions and parameters. Mid-2005/06 marketing year population: 1.104710m. Maize opening stocks were provided by NMC while wheat and rice stocks are from Ngwane Mills and Universal Milling, the two dominant milling companies. On-farm stocks are assumed to be negligible. Planned commercial imports from same sources. Closing stocks are based on two weeks of maize requirement and one month for wheat and rice. Per capita consumption rates are historical averages and are: 127 kg maize; 42 kg wheat; and 6 kg rice. Feed, post-harvest losses and seed use are estimated at about 6 percent of maize production, as by previous missions. Wheat and rice seeds are imported. The balance sheet shows that there is an uncovered national deficit in maize of 34 700 tonnes which needs to met by additional donor contributions. The Kingdom of Swaziland is experiencing its fourth consecutive year of adverse climatic conditions. Localized drought, heat waves and hailstorms and declining crop production are increasing the number of people facing varying degrees of food insecurity over different time periods. Furthermore, livelihoods across all Agro-Ecological Zones (AEZ) and administrative regions have been damaged due to the continuing downward spiral of increasing unemployment, HIV/AIDS prevalence rates and poverty. Even in cases where households have close to a normal harvest this year, it cannot be assumed that they have recovered from several years of successive crop failure. Many households are facing chronic and acute food insecurity, which is not merely caused by poor climatic conditions, but is also compounded by the effects of HIV/AIDS and a general economic decline. The Government’s contribution to alleviating food insecurity includes a provision of E15.0 million (US$2.5 million)3 to WFP under a bilateral agreement with National Disaster Task Force (NDTF) for the period October 2003 to September 2004; an allocation of about E50 million (US$8.3 million) to disaster relief in January 2005 in reaction to the destruction caused by heavy storms; E47 million (US$7.9 million) to the support of orphans through the Ministry of Education in the form of fees and bursaries in February 2005, and a contribution of about E21 million (US$3.5 million) for the fight against HIV/AIDS through National Emergency Response Committee on HIV/AIDS (NERCHA) in March 2005. The National Disaster Task Force (NDTF) under the Deputy Prime Ministers Office is currently responsible for the coordination and management of national response actions to disaster situations in Swaziland. With the ratification of the National Disaster Management Bill by Parliament, a permanent national intergovernmental structure with adequate resources will be put in place that will facilitate and enhance Swaziland’s capacity to respond to environmental, economic and social shocks in the country. The Bill was initially scheduled to be approved in 2004 but it has been postponed up until now. In response to the regional drought in 2002/03, Swaziland was included in the WFP Regional Emergency Operational Plan (EMOP) in July 2002 which phased out in December 2004. At the beginning of the EMOP 144 000 beneficiaries were targeted for food aid, increasing to 265 000 at peak periods of food shortages in 2003. The CFSAM conducted in May 2004 identified 262 000 people facing food/income deficits of varying amounts for the entire year of whom approximately 65 percent were living in the Middleveld and Lowveld. Based on the findings of the assessment, 244 000 beneficiaries were provided with food assistance during the course of 2004. Swaziland received 13 022 tonnes of food aid over the year of which 9 613 tonnes was channelled through WFP and the remaining 3 409 tonnes were non-WFP donations. NGOs donated a total of 2 275 tonnes directly. The EMOP has been succeeded by a three year regional Protracted Relief and Recovery Operation (PRRO) in Southern Africa since January 2005 (Assistance to Populations in Southern Africa Vulnerable to Food Insecurity and the Impact of AIDS) in order to address the underlying chronic causes of the continuing food insecurity in the country. It provides a programming framework for multi-sectoral activity to support food-insecure households affected by adverse weather conditions and HIV/AIDS. WFP’s planned number of beneficiaries under this operation reaches approximately 200 000 beneficiaries which incorporates the ‘’3 by 5 initiative’’4, school feeding, food-for-assets, support to households affected by HIV/AIDS, pre-and post-natal mothers and children under five and neighbourhood care points for orphans and vulnerable children. The CFSAM involved the collection and review of secondary data made available at country level by the Ministry of Agriculture (MoA), the Central Statistics Office (CSO), the National Maize Cooperation (NMC), Ngwane Milling, Universal Milling Company and the National Agricultural Marketing Board (NAMBOARD) etc. With regard to specific information on vulnerability to food insecurity, discussions were held with NERCHA, the NGO Consortium and the NDTF. For the purpose of the primary data collection exercise, the team developed a rapid appraisal questionnaire in close collaboration with its NGO partners, addressing both issues related to households’ crop production as well as food access. The CFSAM team conducted interviews with 144 farmers from all four AEZ and administrative regions in the country5. The results of the questionnaires served as a cross-check of already existing data and were found to be broadly in line with the findings of the assessment conducted by the Swaziland Vulnerability Assessment Committee (VAC) 20056. By means of semi-structured interviews with key informants in 43 Chiefdoms, information on ‘’normal’’ access to food and income7, on hazards (i.e. factors affecting access to food/income such as crop production and market prices) and response strategies (i.e. sources of food and income that people turn to when exposed to a hazard) was collected. A mean food/income deficit as a percentage of annual food needs experienced this year compared to a ‘’normal’’ year was collected by livelihood zone and socio-economic group. The VAC findings have been incorporated in the conclusions drawn in this report and used for the estimation of number of people in need of targeted food aid over the next twelve months. Vulnerability reflects a household’s ability to cope with and manage risks and shocks, and a household’s ability to cope and manage is in part a function of its livelihood strategies. The identification of and distinction between livelihood zones helps to understand the impact of hazards at household level. The Swazi VAC 2004 identified nine Livelihood zones based on the four AEZ, which were used as the sampling frame for the 2005 VAC assessment8. The livelihood patterns vary by zones due to the type and level of agricultural production, sources of income, access to food, etc. Due to the effects of HIV/AIDS livelihood profiles and coping strategies are rapidly changing. Agriculture is the biggest and most important sector in Swaziland with 70 percent of farmers engaged in subsistence farming. Thus shocks to agricultural production have drastic implications for the majority of people in the country. The majority of rural families, especially the poor, across all livelihood zones purchase rather than grow, most of the staple food they consume. About 69 percent of people live in extreme poverty with the majority found in the rural areas. Due to the prevalence of subsistence farming, poor Swazis rely on crop sales and casual labour for cash in the agricultural sector. Recent retrenchments and closure of textile industries and cotton ginneries have resulted in sharp decline in household income in peri-urban areas. Employment has decreased to about 25 – 50 percent compared to a ‘’normal’’ year. In 2004, employment opportunities in the peri urban zone were normal (VAC, 2004). The decline has severely eroded the purchasing power of households whose main source of food is through purchase, the main source for households across all three socio-economic groups in that region. Food production was also down, mainly affecting the better off households who depend on their own production as a source of food as much as they purchase. The annual mean food/income deficit has worsened drastically since last year, and is estimated at 40 percent of normal. The decline in crop production this season was felt by the poorer households due to lack of resources necessary to purchase farm inputs (hiring of tractor, fertilizer, etc.). Crop production as a source of food for the better off remained the same. Furthermore, the ability of poorer households to purchase food has dropped substantially. Availability of gifts and relief transfers within the community is far from normal levels. Combined with a decrease in employment opportunities of 25 - 50 percent of normal, the food income deficit faced by the population in the Moist Middleveld reaches 40 percent. The trend in the Dry Middleveld is similar, the difference being a less drastic drop in households’ ability to purchase and continued availability of gifts and relief within the community. Regardless of the continuing depressed situation in both regions, compared to 2004 the overall food/income deficit has decreased slightly. Taking coping strategies into consideration, no food/income deficits will be experienced in these two regions. Although a slight decrease in maize prices has occurred this year across all zones, the prices still remain 15 percent above ‘’normal’’, and the maize prices has increased over 40 percent since the beginning of 2002. This has made poor households particularly vulnerable to food shortages as they cannot afford to purchase food through the markets. Most frequently observed livelihood strategies have been changes in consumption pattern, use of cash reserves and sale of assets, sometimes of livestock, labour migration, engaging in trade and in community social safety nets such as redistribution of available food within the community. During CFSAM interviews households cited coping mechanisms such as the reduction of meals consumed during the day and the withdrawal of children from school to save money. The mission did not witness severe stress indicators common to emergency situations such as mass migration, depletion of assets and prostitution. However, given the limited time of the CFSAM, monitoring of the situation is strongly recommended. HIV/AIDS is both a cause and a consequence of food insecurity. On one hand, households affected by the pandemic often resort to coping mechanisms that alleviate the problem in the short term but with long-term detrimental effects on households’ livelihood, leaving them inapt for future shocks due to lack of assets, steady decline in agricultural production, etc. On the other hand, food insecurity increases people’s vulnerability to HIV/AIDS infection in cases where affected households resort to high-risk survival strategies such as prostitution. The HIV/AIDS prevalence rates in Swaziland have continued an upward trend (see table 6). The Ministry of Health and Social Welfare 9th HIV Sentinel Survey (2005) found 42.6 percent of women between the age of 19 to 49 years attending antenatal care (ANC) to be HIV positive in 2004, reflecting a 4 percent increase since 2002. The prevalence rate among women between 25-29 years of age is 56 percent. Between 200 000 and 250 000 people are currently living with HIV and AIDS and about 26 000 of them are in need of antiretroviral treatment9. Adult’s mortality rate has been increasing steadily, bringing the national life expectancy at birth down to 35.7 years (2002). Due to the rising morbidity and mortality rates associated with HIV/AIDS particularly among young adults, the epidemic has brought about approximately 80 000 children as orphans (NERCHA, 2004), a number projected to rise to 120 000 in 2010. 1/ Data from the bi-annual HIV Sentinel Surveys conducted by the Ministry of Health and Social Welfare. Furthermore, women are disproportionately more infected by HIV/AIDS than men10. The VAC (2003) found that women have higher levels of morbidity and mortality at younger ages than men. Since women take the role of caretakers, breadwinners and providers of food, women’s increasing morbidity and mortality rates adversely affect household’s food security and particularly the nutritional status of young children . According to Whiteside et al (2003)11, the uniqueness of Swaziland in terms of HIV/AIDS stems from how uniformly high the epidemic is, with no significant differences between administrative regions and between urban and rural areas. The CFSAM team found that 30 percent of the households interviewed had a family member with a chronic illness. With the economically active population being the most severely affected by HIV/AIDS, community structures are over-burdened, safety-nets are breaking down while the number of dependents is continuing to rise. Young children, the elderly and sick – all of whom are unable to earn a regular income and sustain remaining family members – are the groups most vulnerable to the impact of HIV/AIDS and food insecurity. About 15 percent of households are currently headed by children in Swaziland who are left to fend for themselves with approximately four children per household and an average age of 11 years (UNICEF, 2002). In most cases they are too young to work and lack the knowledge of basic agricultural techniques for home production. The Government in collaboration with UNICEF is currently putting all its efforts into filling the vast information gap on its populations’ nutritional status13. On the basis of existing data, Swaziland appears to have one of the lowest rates of child malnutrition in the region with 12 percent underweight and 31 percent stunting14. Nevertheless, according to WHO (1997) ‘’cut off points’’ for classifying the prevalence rates of malnutrition among children under five, underweight in Swaziland is medium, whereas stunting is classified as high. Stunting is an indicator of chronic malnutrition that reflects the long-term deteriorating nutritional situation. Due to the very high prevalence of HIV/AIDS it is expected that child malnutrition across the country will continue to deteriorate over the years (SVAC). Poor nutritional status of children under 5 years was found across all AEZ. At the national level over 40 percent of the children surveyed were stunted; 2.2 percent were wasted (a measure of acute malnutrition) and 11.0 percent were undernourished (see table 7). The Lubombo Plateau and the Lowveld, the two zones receiving the least rainfall and lowest agricultural production, revealed the highest rates of stunting and underweight. The national unemployment rate is 31 percent (2004), up from 22.7 percent eight years ago (1997). Due to declining agricultural production, casual labour on farms is no longer an option for the vast majority of Swazi households. Casual employment provides essential income in rural areas and makes the difference between poverty and improved living conditions. But with declining disposable income, agricultural inputs are unaffordable, further reducing yields, accelerating the downward spiral of increasing poverty. The closure of cotton ginneries in 2004 has led to substantial losses of income opportunities over the past few months. About 10 000 jobs have been lost since August 2004 and a further 30 000 are at risk in the textile and sugar industries. The textile industry is the second largest employer in the country with 30 000 workers, nearly equal to the government, the country's top employer with 37 000 workers. The impact of a depressed labour market in the cotton industry is heavily felt in the Lowveld region where poor rural households depend on cotton cash income to gain access to food. Wealthier households, commonly those that receive remittances from miners or other labourers working in South Africa or Swaziland towns, have less disposable income to perform the role that they used to, i.e. employing poorer households to do agricultural weeding, herding, domestic work and many other jobs that sustained poorer households. Stressed labour markets, however, have also increasingly affected the more well-to-do areas of the Highveld over the past few years15. The increase in small-scale enterprises in Swaziland, which has the potential to eradicate poverty among a new generation of entrepreneurs and materially assist the national economy, has been undermined by the increasing prevalence of HIV/AIDS16. An increasing number of employees have been leaving their jobs due to illness, causing lower worker productivity, more sick leave and unmet contracts. The negative trend in the labour market has contributed to a drastic reduction of income levels and impoverished the population. Sixty-nine percent of the population lives below the poverty line with E128.60 (US$21) per month, an increase in poverty of 3 percent since 2004. The current average annual income is the equivalent of a modest burial or just above half of annual school fees for one child17. Swaziland has one of the world’s highest Gini coefficients, whereby the top 10 percent of the population controls 40 percent of wealth, while the bottom 40 percent of the population control only 14 percent of the wealth. The main household expenditures identified by the CFSAM included school fees, purchase of food, medication and farm inputs. Compared to 2004, maize prices have gone down slightly this season. However, the inflation is continuing with average maize meal prices at approximately E12-15 (US$2.25) per 5 kg18. Prices could be substantially lower if milling companies in Swaziland were directly importing maize from South Africa. The National Maize Cooperation (NMC), responsible for providing a market for Swazi maize farmers, has fixed a price for local purchases, which is double the SAFEX price for maize in South Africa (R598/tonne)19. The VAC 2005 recommends that the Swazi Government revisits its internal pricing regime. Given that domestic maize costs are widely divergent from the regional and global context, maize imports from South Africa would be highly advantageous. The CFSAM estimates of emergency food aid requirements for 2005/2006 are based on the findings of the VAC analysis, which were verified by field work and secondary analyses carried out during the mission. varying degrees of vulnerability by livelihood zones were identified by the VAC 2005 with average annual food deficits ranging from no food deficits in Highveld regions to deficits of 54 percent of annual food requirement in the Lowveld food economy zones (see Table 8). The CFSAM recommends assistance to households with annual food/income deficit of more than 18 percent. The deficit was translated into number of months a households would face a deficit if they had to consume a minimum dietary intake. Based on the above, the Mission concludes that 493 000 people face a significant food/income deficit of varying degrees depending on location and socio-economic group, amounting to 27 000 tonnes of maize equivalent between July 2005 and March 2006. About 50 percent of the affected population is from the poor socio-economic group (227 000). Households forced to resort to negative coping mechanisms as a means to gain access to food, (i.e. selling off important assets such as tools, taking children out of school to save money, etc.). The current PRRO 10310 provides the necessary framework to tackle the ongoing food insecurity. WFP, in close collaboration with partners, is strongly advised to implement multi-sectoral interventions to help the most affected population to re-establish their livelihoods and progressively improve their ability to resist future shocks. Efforts should be made to expand on already ongoing activities under PRRO 10310, build on other existing initiatives and consider recommended non-food strategies to avert food insecurity in the long-term. Cooperation with partners in education and HIV prevention should be linked to all WFP’s interventions whenever and wherever possible. Food assistance will need to be carefully targeted and focus on the most food insecure areas and vulnerable groups affected by this season’s bad harvest and who have no more means available to cope with its impact. Direct food transfers for patients receiving ARV treatment and their families should be ensured. WFP’s provision of nutritional supplements should be extended to all six clinics in the country where ARV is currently accessible. Orphans and vulnerable children remain one of the most important groups to be targeted for continued assistance which should be channelled through NERCHA’s programme that builds on existing systems and structures such as the traditional concept of Indlunkhulu and the Neighbourhood Care Points (NCP). School Feeding is recommended as part of the relief and recovery process and is strongly recommended to be continued, possibly in combination with FAO’s initiative of School Gardens to ensure diversification of daily meals provided in schools. Food-for-Asset and Food-for-Work activities should contribute to the reduction of ever-increasing poverty in rural areas by means of rural employment opportunities through Safety Nets. Apart from the urgent rehabilitation of the cotton industry, other necessary interventions identified by the VAC 2005 include the support for small-scale irrigation for household hygiene, sanitation and income potential through production of cash crops for sale, rangeland rehabilitation, forestry and fire management schemes and other conservation works such as the eradication of invasive species and the construction of earth dams to reduce vulnerability of livestock. Education in practical agricultural studies in primary and secondary schools and at Neighbourhood Care Points (NPC) for orphans should be considered as a possible intervention20. Subsistence farmers should also be targeted to help them maximise the output from their land by diversifying farm activity and increasing production from traditional crops, encouraging them to get engaged in commercial livestock farming, etc. The VAC 2005 recommends the introduction of micro-credit schemes, information sharing and technical advice in support of the ‘’self-employed’’ and various ‘’non-farm’’ or ‘’off-farm’’ income generating activities. The joint FAO/MoAC Input trade fairs (ITF’s)21 target vulnerable farmers who are given vouchers/coupons for which they can buy farm inputs according to their need and choice. The CFSAM team interviewed a number of farmers who had clearly benefited from this initiative. The VAC 2005 recommends rural market infrastructure and market-based interventions to be an important focus for development. Food marketing policy, infrastructure and services should be targeted for support, reform and development. The simulation of lower food prices in the current assessment indicates not only a reduction in the overall levels of vulnerability but how marketing reforms/efficiencies could completely eliminate the measured deficits in marginally affected areas. WFP’s procurement policy encourages support to local and regional markets and economies. Approximately, one-half million dollars have been spent in Swaziland to buy locally produced cereals between November 2004 and January 2005. Constraints for local purchases of maize meal concern the prices offered by the local millers which are significantly higher than those provided by the lowest South African bidders. Additional limitations concern the quality of the product and timeliness of deliveries. Nevertheless, WFP is not ruling out buying opportunities within the country. The two Highveld Livelihood Zones (Highveld Maize & Cattle and Timber Highlands & Peri Urban Corridor) are characterised by relatively high maize production levels that are usually greater than in any of the other areas because rainfall is conducive and fairly reliable in quantity and quality. Better off wealth groups depend on their own production (35 percent) in combination with purchases (41 percent) whereas poorer households rely significantly more on purchasing their food (41 percent) than producing it themselves (13 percent). Poor households in this zone are more dependent on employment/remittances as their main source of income than better off wealth groups, but non-food production and trade also make important contributions to overall income. Livestock and cash crop sales play an important role as income source, particularly for the better off groups. Total rural population: 326 000. The Wet Middleveld exhibits some ecological differences due to variation in altitude (600-800 m) and levels of rainfall. The zone is characterized by a range of primary smallholder production, livestock rearing and non-agricultural employment. Maize is the main food and cash crop for better off households whereas the poorer people are more often seen as labourers working for others. The wealthier households have sufficient staple food needs from their own production (48 percent) and have access to official employment in contrast to the poorer households. Poor households have access to land, however, only produce a fraction of their staple food needs from their own production (13 percent). They are mainly dependent on daily or seasonal employment and derive most of their food access from purchases (53 percent) compared to the better off (24 percent). Total rural population: 129 000. The Dry Middleveld is a combination of the more productive Wet Middleveld and more drought prone region of the Lowveld. Droughts occur frequently thereby challenging farmers’ maize production. Non-the-less, maize provides the main staple food crop even in the relatively less productive areas of this livelihood zone. Poor farmers currently make up 50 percent of all households in this area. Purchased food makes up a high percentage of their food in-take (51 percent) whereas food access from own production is rather low (21 percent). This in turn results in high dependence on casual and other employment for cash. Communities in this zone are sensitive to losses of purchasing power linked to the terms of trade for their staples and the relative price of maize. The better off households are estimated to have three to five times the income of the poor, mainly relying on their own crop production (48 percent) and purchases (48 percent). Total rural population: 138 000. The two Lowveld Livelihood Zones (Cattle, Cotton & Maize and Cattle, Cotton) are characterized by low and temporally erratic rainfall. Households across this zone have been experiencing continuous droughts since 2002/2003. Poor households gain only a fraction of food from their own production (15 percent) and commonly purchase the majority of food and supplement (56 percent-62 percent) with collection of wild foods and gifts from relatives and friends. Clearly, food prices are important if households are heavily reliant on purchase. The better off groups, on the other hand, are much more vulnerable to crop failure because they get more than half of their food needs from their own production (39-55 percent) and purchase only one third of their food access (33-38 percent). The poor rely much more on employment and remittances than the better off wealth groups. The latter are more diversified and can fall back on a combination of income from employment, sale of cash crops, particularly cotton, livestock sales and other trading activities. As a result, vulnerability varies with the different wealth groups, whereby the poor are more vulnerable to a fall in employment opportunities while the better off wealth groups will suffer more from shocks to cash crop and livestock. Total rural population: 206 000. The Lubombo Plateau is characterized by greater agricultural production than the rest of the Lowveld due to its elevated position receiving more rainfall. Access to food by the poor is dominated by purchase of food which is supplemented by contributions from wild foods and gifts. The better off groups have more diversified income strategies with cash crops such as cotton and most importantly cassava, playing an important role in combination with trading and non-food production activities. Total rural population: 24 000. This report has been prepared by Mwita Rukandema and Abdirazak Awale and Lisa Biederlack under the responsibility of the FAO and WFP Secretariats with information from official and other sources. Since conditions may change rapidly, please contact the undersigned for further information if required. 1. Background information for this chapter is mainly from recent reports of the Economist Intelligence Unit (EIU), World Bank, Central Bank of Swaziland and the 2005 Budget Speech read on 9 March. 3. Exchange rate of E6 to 1US Dollar. 4. The WHO/UNAIDS ‘’3 by 5’’ initiative aims to provide life-long ARV therapy (ART) to 3 million people living with HIV/AIDS in poor countries by the end of 2005. 5. See Annex 2 for an illustration of the overlap between the four Agro-Ecological Zones and the four administrative regions. 6. The SVAC 2005 includes members from the National Disaster Taskforce (NDTF), the Central Statistics Office (CSO) of the Ministry of Economic Planning and Development (MEDP) the Ministry of Agriculture and Cooperatives (MoAC), the Ministry of Health and Social Welfare (MoHSW), the World Food Programme (WFP), Save the Children Swaziland and the Swaziland Farmers Development Foundation (SFDF). 7. Households were grouped according to where they live and their socio-economic group (wealth), and then generated livelihood baseline information for typical households in each group for a defined reference or baseline year, i.e. the ‘’normal year’’. 9. ARV treatment is needed when the HIV virus has damaged a person’s immune system which can be tested with a range of different blood tests. 11. Whiteside, et al. (April 2003). What is driving the HIV/AIDS epidemic in Swaziland, and what more can we do about it? 12. Ministry of Agriculture and Co-operatives, the Federation of Swaziland Employers and UNAIDS (2003), The Impact of HIV/AIDS on Agriculture and the Private Sector in Swaziland, Jubilee Printers, Matsapha, Swaziland. 13. A nutrition surveillance system for the collection of nutritional data and potential increases in micronutrient deficiencies is currently being established. 14. UNICEF, Nutrition Fact Sheet, June 2004. 15. Swaziland Vulnerability Assessment Committee, Annual Vulnerability Monitoring Report, May 2004. 17. Education in Swaziland is not free and universal; yearly school fees for one pupil range from E200 (US$40) tp E800 (US$160). 19. NMC purchases maize from local producers at E1 000/tonnes, sells to millers at E1,140/tonnes and the millers sell at E12/5kg. 20. FAO is working with WFP, UNICEF, NGOs and local institutions to establish Junior Farmer Field and Life Schools for children and young people in response to the growing numbers of AIDS orphans in the Southern Africa Region. The schools aim to share agricultural knowledge, business skills and life skills with the children between 12 and 18 years of age. 21. This intervention, implemented by FAO and the MOAC, was successfully implemented in October/November 2004 and is recommended to be continued. This project should be expanded and implemented throughout the country with particular emphasis on those areas affected by drought this season 2004/2005. Currently, FAO is targeting 10 000 farmers under this project. 22. Source: Swazi VAC 2004; On the grounds of their relatively similar livelihood patterns, the Highveld, Timber Highlands and Peri Urban Corridor were merged together as Highveld and the two Lowveld livelihood zones were merged as Lowveld region.